This recipe combines the radishes, their tops and balsamic in an addictive combination. Radishes just beg to be popped, and these garlic-y sweet and pungent numbers go fast! Lightly cooking radishes is also a feast for the eyes, because when heated the vibrant red turns a beautiful muted rosy color, which provides a wonderful surprise when served! Radishes are the bees knees! Crisp, cool, collected—with a bit of heat, radishes are really a treat. 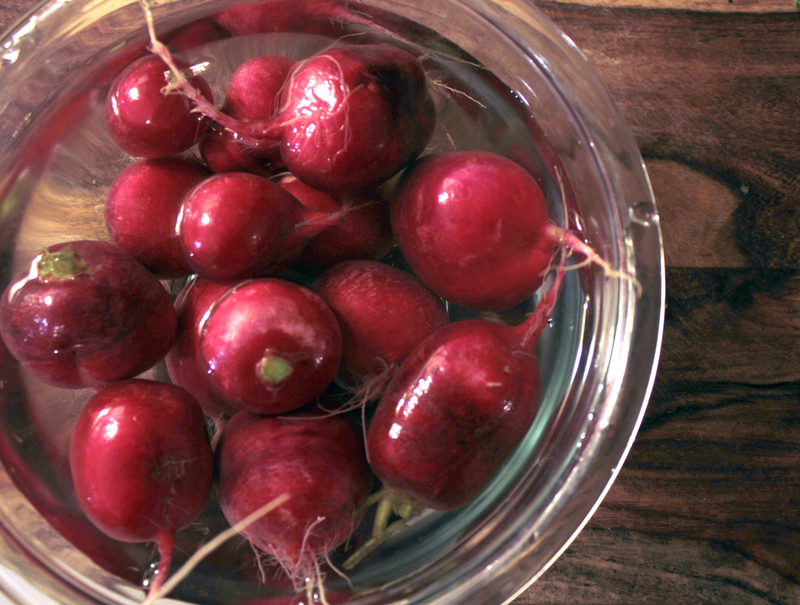 If I'm not growing my own, I love to get my radishes at the famers market, bring them home, and pop them in a bowl with water in the fridge to keep them crisp and fresh (and oh so easy to snack on). Radishes have lot’s of good vitamin c in them, as well as fiber. Radishes also contain amylase, the enzyme the body uses to digest carbohydrates. The Japanese often add radishes to heavy carbohydrate-filled meals to aid in digestion. I find it fun to pop a few at the close of a meal to cleanse my palette and reap some of the digestive benefits to boot! Wait, did you say we’re eating the radish tops? Yes! The leaves have a slight spice to them and are really dang good! Plus…the radish greens contain more calcium, iron and vitamins A and C than the radish itself! For this recipe you wantto get the freshest radishes you can, because the leaves are quick to wilt. Luckily, radishes are all over the farmers market these days, in a startling variety of shapes sizes and colors. When raw, the radish leaves have the slightest prickle to them, but this goes away when sautéing, especially when semi-drowned in olive oil and balsamic vinegar! Cut off radish tops and set aside. Slice radishes in half and toss with 1 T olive oil and 1T vinegar. Spread on a baking sheet and bake for 20-30 min until golden. While baking, heat 1T oil, 1T vinegar and garlic in a skillet until hot (med high). 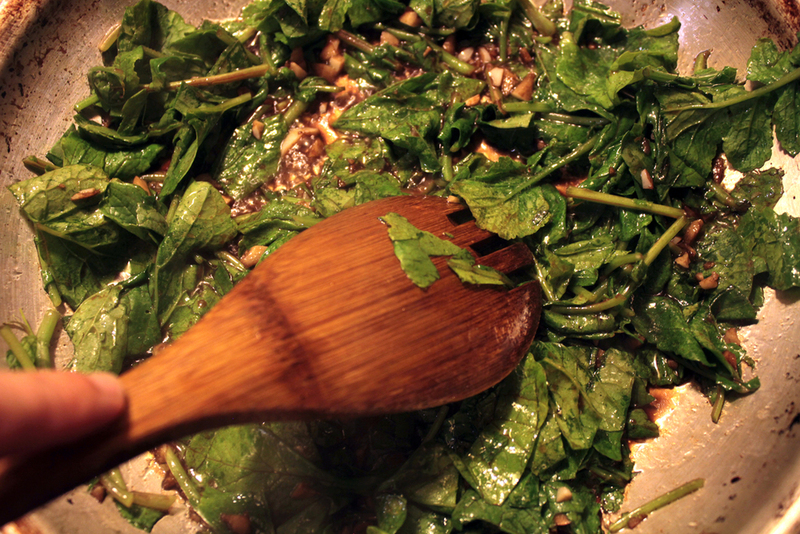 Add chopped radish greens for just a couple of minutes, until bright green and wilted. Toss greens with radishes in serving dish.